I seem to have a lot of mobile devices to keep charged in my home. Keeping all the chargers straight and neat is challenging – Powermat Wireless Charging is a much better way to charge and get rid of all those chargers! We recently tested out several of their products. 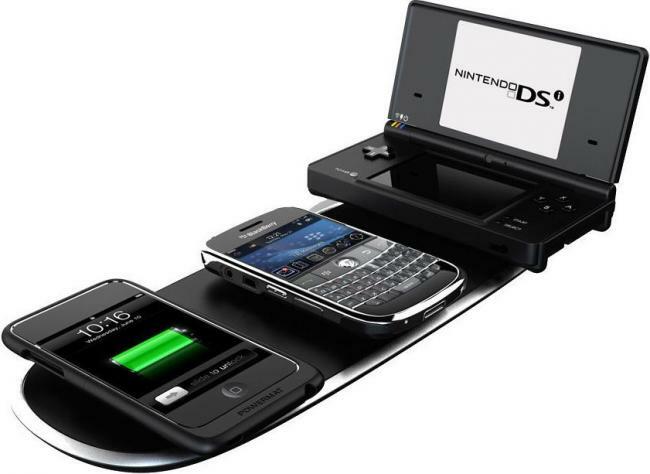 The Home and Office Mat ($99) is excellent – you can charge up to 3 devices simultaneously. All you do is plug in the mat and place Powermat receiver cases on your favorite gear and then place them on the mat to charge. Powermat offers receiver cases that work on iphone 3G ($69.99), ipod touch ($39.99), as well as many more. If you have a device that isn’t supported by a Powermat Reciever case, use the included Powercube Universal Receiver, with comes with a 8 mini and micro USB tips included (other tips sold separately). Adjustable sound and light indications give feedback that charging is occurring – while a small magnetic pull ensures perfect alignment and optimal charging efficiency. I would recommend keeping this out of your bedroom if you plan to charge a device late at night (my husband hates the sound). We also liked the Powermat 2x ($59.99) that charges 2 devices at the same time. If you are frequent traveler, you may prefer the Portable Mat ($99), which folds up and charges up to 3 devices simultaneously. Comes with a travel case with magnetic closure and a Powercube Universal Receiver with 8 tips. All Powermat devices come with a power adapter that comes will work with a wide range of voltages (100-240VAC). The adapter also meets Energy Star level 5 efficiency requirements. Thank you to Powermat for providing product samples.